If you are suffering from neck pain and/or back pain, or you have ongoing headaches that seem to be consuming your life, acupuncture is something you should consider. This age-old, natural, and safe technique helps improve the flow of energy around your body. This helps your body utilize its natural healing powers to boost your overall well-being and improve your symptoms. One of the most common things our patients ask us is about the needles we use. If you feel nervous about the thought of acupuncture, you don’t need to worry because as many as FIVE acupuncture needles would fit into a standard hypodermic one! Although there isn’t a clear-cut definition of how acupuncture works, theories suggest your body has many meridians and each of these are connected to create a flow of qi (circulating life force). Inserting needles into a number of these touch points helps loosen any blockages, allowing this all-important energy to start flowing around your body again. When we place these needles into the key areas, you may feel a slight “pricking” sensation. But because of their rounded, ultra-fine tips, they won’t cause any damage to your cells, nor will they induce pain. In fact, many of our patients feel incredibly relaxed throughout their consultation and leave feeling calm, rejuvenated, and energized. 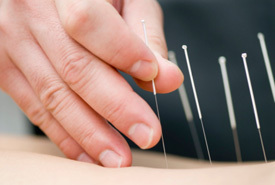 Acupuncture is renowned for treating a range of conditions which cause chronic and ongoing pain. It’s also effective at treating a large host of other conditions, which our specialists can discuss with you.